It's been a full year of delicious anticipation, this waiting for the second volume in Sherry Thomas' delightful Lady Sherlock series. I thoroughly enjoyed A Study in Scarlet Women last year, and I had just a really good gut feeling about where the sequel would take my favorite characters—from the absolutely flawlessly rendered Charlotte Holmes and the impenetrable Lord Ingram, to Mrs. Watson, Livia and Bernadine Holmes, and poor, beleaguered Inspector Treadles. 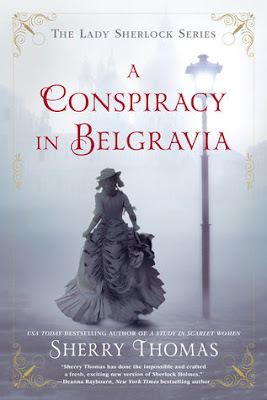 I was so pleased to be back in their company once more when I finally cracked open my copy of A Conspiracy in Belgravia and commenced reading. It took her awhile, but now Charlotte is living in something more akin to the manner she would prefer. Together with her companion Mrs. Watson (and Mrs. Watson's irrepressible niece and aspiring physician Miss Redmayne), Charlotte is becoming extremely well-versed in the solving of all things mysterious around London. The only black marks on her new life are the distance she is forced to maintain from her sisters Livia and Bernadine and the mutual distance she and Lord Ingram force themselves to maintain from each other. The entire delicate balance is thoroughly upended, however, when none other than Lady Ingram herself requests a consultation with the increasingly infamous Sherlock Holmes. It is a matter of some delicacy, according to Lady Ingram, concerning a young man she once loved. A man she passes once every year at an agreed upon time and place to assure one another of the other's continued safety and devotion from afar. But the man missed their silent rendezvous this year, and Lady Ingram will know the reason why. And so Charlotte finds herself in the most untenable position of investigating on behalf of her oldest and dearest friend's estranged wife, and doing so behind his back. And just when she thinks this case cannot possibly get more personal, it does, and there is absolutely no hope of turning back. Charlotte rarely resorted to imagination—observation yielded far better results. And while the world was made up of innumerable moving parts, in her own personal life she saw no reason why decisions shouldn't be simple, especially since most choices were binary: more butter on the muffin or not, run away from home or not, accept a man's offer of marriage or not. Soundlessly his fingers tapped the crest rail on which they rested, each one by turn. "Years ago, you said something to me. I don't remember it word for word, but in essence, you told me that men, even otherwise sensible men, fall under the illusion that they will be able to find a perfect woman. That the problem lies not in the search so much as in the definition of perfection, which is a beautiful female who will integrate seamlessly into a man's life, bringing with her exactly the right amount of intelligence, wit, and interests to align with his, in order to brighten every aspect of his existence." She remembered that conversation, one of the most disharmonious they had ever held, on the subject of the future Lady Ingram. "You warned me against believing in the illusion—and I was highly displeased. I didn't say so at the time, but as we parted, I thought that you'd certainly never be mistaken for a perfect woman. It was beyond evident you'd never fit readily into any man's life, and no one could possibly think that the purpose of your life was to be anything other than who you were. At the time, those were not kind thoughts. They flew about my head with a great deal of scorn—venom, even. My opinion of you hasn't changed, by the way. But nowadays I think those same thoughts with much resignation but even more admiration." Their eyes met again. His were still the same mysterious green, but now there was a warmth to them, a deep affection tinged, as he said, with much resignation but even more admiration. "I'm sure I'll fly off the handle and accuse you of all kinds of perfidy once I learn what you've been up to, but let it not be said that I don't know who I'm dealing with. We disagree often, and that is a fact of our friendship. Thank you for listening to me, by the way," she said, "when you didn't wish to hear a single word." He would always listen, when she had something to say. That he did not voice aloud, because she already knew. I feel compelled to note just how emotionally astute this novel is. It is one of its most important qualities. The ring of quiet truth kept rolling over me in waves throughout my reading experience. And, yes, much of it Charlotte's undeniable acumen. But much of it is Ms. Thomas' ability to let a scene unfold in its own time. No moments are rushed. No dialogue is off in the slightest. As Charlotte notes at a certain point, "The old silence threatened to descend." An ever-present sense of the weight of one's personal history, of the quiet, but inexorable accumulation of a life's worth of decisions, their provenance, and their consequences, pervades this story in achingly beautiful ways. The different levels of haunting are delicately explored, in both the coils of the investigation and the ties that bind each character together. I so appreciated this book's subtlety and its increasingly nuanced ruminations on what it means to know someone and to be known by them, to see as we are seen. Sherry Thomas carries the whole thing off just splendidly. This is a sequel to behold. A sequel for the books, as it were. Never think of missing it.